Tonight’s dinner featured leftover lasagna, which was delicious! It seems that many of your are reticent to try my tofu sub-in, but believe me people, it tastes good! Silken tofu and ricotta both have a similar texture, so they have the same role in the lasagna. Although tofu does not have the same taste as ricotta, I feel that it is a tasty ingredient. While the lasagna was good, my true love was with this. 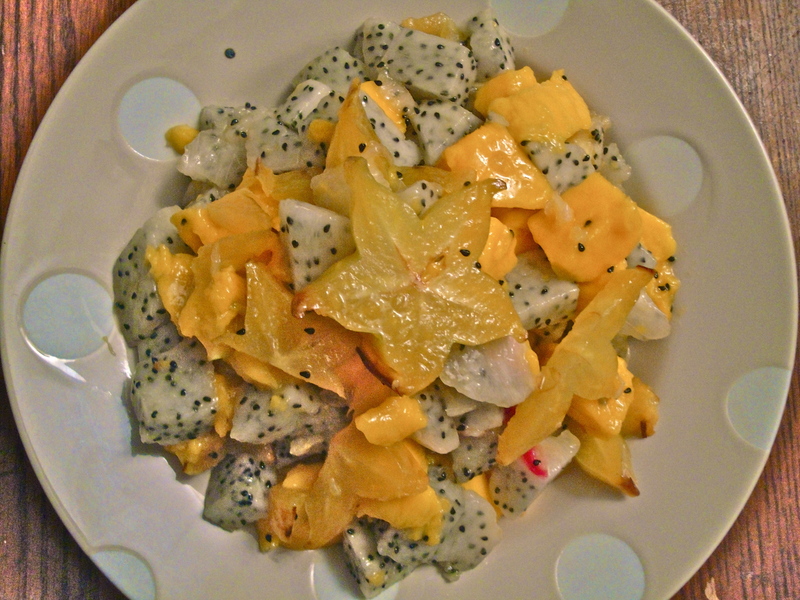 A delightful tropical fruit salad made with star fruit, dragon fruit, and mango. I shared this with Tim, but could have easily devoured the whole thing! I love fruit so much! I had a long day and didn’t get home until much later than usual, but I was so antsy to get a run in. I settled on 4 miles, which was all the daylight I had time for. 4 miles now seems to me like an uber-short distance, so I had to make it hard by running up the steepest hills I could find for the length of the run. If you are crunched for time, make your workout harder than usual. An increased effort can gain you the same benefits as a longer workout done at an easier pace.